Luisa said to my aunt (Fr. Bernardino Giuseppe Bucci, O.F.M. referring to his Aunt Rosaria Bucci) “You will be my witness” and one day Padre (now Saint) Pio told her point-blank in his Benevento dialect: “Rosa’, va nanz, va nanz ca Luisa iè gran e u munn sarà chin di Luisa” (Rosaria, go ahead, go ahead for Luisa is great and the world will be full of Luisa). My aunt often recounted this episode, but things were not going well: everything indicated that Luisa would soon be forgotten. I answered that there would be no easy solution to the case of Luisa Piccarreta Indeed nothing further was said of it in Corato either, and Padre Pio’s words could have been considered merely a comforting remark. But Aunt Rosaria retorted “No! During my confession Padre Pio told me that Luisa is not a human factor, she is a work of God and he himself will make her emerge. The world will be astounded at her greatness; not many years will pass before this happens. The new millennium will see Luisa’s light“. 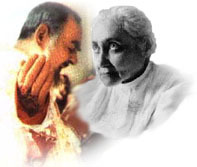 When Luisa was condemned by the Holy Office and her works put on the Index, Padre Pio sent her this message though Federico Abresch: “Dear Luisa, saints serve for the good of souls, but their suffering knows no bounds“. At that time Padre Pio was also in very great difficulties. Saint Padre Pio sent many people to Luisa Piccarreta and would say to the people of Corato who went to San Giovanni Rotondo: “What have you come here for? You have Luisa, go to her“. “. . . in my All-Seeingness, I see that these writings will be for My Church as a New Sun which will Rise in Her midst; and men, attracted by its Radiant Light, will strive to transform themselves into this Light and become spiritualized and Divinized, and therefore, renewing the Church, they will transform the face of the earth. Indeed, a few days later, Aunt Rosaria was summoned by Archbishop Addazi of Trani, who said to her: “Miss Rosaria, I do not know whether to reprimand you or to admire you for your courage. You have faced the guard dog of the Church, the great defender of the faith, without being bitten”. I answered that there would be no easy solution to the case of Luisa Piccarreta Indeed nothing further was said of it in Corato either, and Padre Pio’s words could have been considered merely a comforting remark. But Aunt Rosaria retorted: “No! During my confession Padre Pio told me that Luisa is not a human factor, she is a work of God and he himself will make her emerge. The world will be astounded at her greatness; not many years will pass before this happens. The new millennium will see Luisa’s light”. I was silent at this assertion and my aunt asked me: “But do you believe in Luisa?”. Then she said to me: “Come to my house in a few days’ time, because I have something very important to tell you”. It was during the 70s and Padre Pio had been dead for a several years. She looked at me and said: “What I am going to tell you now is of the utmost importance. Try to use it well and I urge you to meditate on the miracles of the Lord who gave us Luisa, a precious creature in God’s eyes and an instrument of his mercy. You would find it hard to discover such a precious, great soul. Luisa goes beyond herself, and you can only contemplate her fully in God’s mystery. Mary was the One who brought redemption into the world with her Fiat, which is why the Lord enriched her in such a wonderful way that she became a creature who was raised to the dignity of Mother of God. Mary is the Mother of God, and no other creature will ever equal her in greatness and power; after God it is she alone who expresses the Lord’s marvels to the world. After Our Lady comes Luisa, who brings the world the third Fiat, the Fiat of Sanctification”. “That is why Luisa was always nailed to her bed and every day offered to the Divine Majesty as a victim of expiation to God’s Most Holy Will”, she continued. “God was pleased with this creature and so jealously guarded her that he removed her from human beings, entrusting her only to his Church, so that she could preserve her and humanly forge her with infinite penances and misunderstandings. My Luisa knew no human consolations but only divine ones; her body was continually suspended between heaven and earth, and her earthly life was a continuous contradiction in comparison with normal human lives. Even in her body, she had to belong entirely to God”. She then confided to me: “One day the Lord said to Luisa: ‘all those who have seen and known you will be saved’”. “Dear Peppino, this is an extraordinary gift of God and it has remained shrouded in silence because Luisa did not want knowledge of it broadcast, or she would have become the object of curiosity or veneration which, she said, she did not deserve. Except that one day her confessor told me that I could speak of it and spread it with discretion. Now I have told you, in the hope that you may be able to make good use of it”. Padre Pio’s quotes taken from Padre Pio of Pietrelcina’s Letters, Volumes I, II & III. “Let us adore God’s will and be ready to confirm our will in all things and at all times to the will of God. In this way we shall give glory to the heavenly Father, and everything will be to our advantage for eternal life. In San Giovanni Rotondo, she attended the Cenacles of Federico Abresch on the Divine Will, when Luisa was still alive. During the 40’s, Federico Abresch became a close friend and disciple of Luisa. He used to visit her house and learn, directly from her and from her manuscripts, of the Sublime Truths of Living in the Divine Will. He also exchanged frequent correspondence with Luisa. Federico Abresch, a Franciscan Tertiary. Complying with wishes of Padre Pio of Pietrelcina, he was the first apostle of the Divine Will in S. Giovanni Rotondo and did much to spread Luisa Piccarreta’s writings. 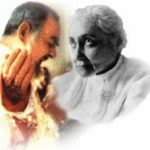 In the following interview, made in 1994 on the occasion of the Fiftieth Anniversary of the Transit into Heaven of Luisa Piccarreta, Miss Adriana Pallotti gives clear testimony on the fact that Padre Pio knew and loved Luisa and her Writings. She also gives wonderful testimony on the conversion of Federico Abresch through Padre Pio, on the First “Divine Will” Cenacle in the San Giovanni Rotondo, and on direct and specific comments of Padre Pio regarding the spreading of the writings of Luisa. In 1926, a year later, Abresch’s wife began to hemorrhage, and doctors diagnosed a tumor in her womb….Amalia Abresch was devastated by the certainty that a hysterectomy would leave her incapable of bearing children, so she went to Padre Pio…he told her not to submit to the knife. After that, the hemorrhages ceased and, although the tumor remained, to her great delight, she conceived and, at the age of nearly forty, gave birth to a son. The boy, who was named Pio, later became a monsignor.